It's cold and flu season, so it's time to break away from the sniffles and try to wrangle that cough. I've told you about my new love for Maty's Health Products when I started using their cough syrup. It's made with buckwheat honey, and it works SO GOOD on our coughs. It's a natural way to relieve them without the crazy chemical filled ones that they can't even take until they are six years old. After talking to the founders of Maty's Healthy Products, I learned about the fact that Vicks VapoRub can irritate the airways and increase mucus production. Particularly in infants and young children (under 2) who have very small airways to begin with. I have a preemie in my house, and she always suffers more than her sister when she is sick, I think her immune system is weaker, and her lungs just aren't as strong because she was born early. Poor thing is miserable when she gets sick. 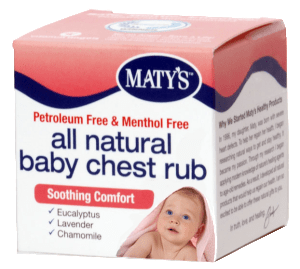 Maty's makes a chest rub for children and adults (over 2) that only uses essential oils like Eucalyptus Radiata, Lavender, and Chamomile to relieve coughs and congestion, and it works really well. The baby chest rub is approved for ages three months and older while the regular formula is for ages 2 and older. Maty's Chest Rub is free from petroleum and menthol making it drug-free, chemical free, and paraben free. It works to strengthen your child’s immune system while providing relief for their discomfort. One of the best tips I've gotten for those nights that a cough gets really bad, you put the rub on your child's feet and put socks on them. I don't know the biology behind why, but it works really well. There is a reason it is a 3-time national award winner. I wrote about the fantastic benefits of Eucalyptus oil, like its antiseptic, antimicrobial, and anti-inflammatory properties. It's like the miracle essential oil; I love it. Maty's Health Products line has grown substantially in the last few years, and they are now offering organic products as well. My husband still wants to chalk up all this natural talk to hoopla but when you see results from simple ingredients, it's time to rethink all the chemicals that are going into and on our bodies and those of our children. Although I partnered with Maty's to bring you this review, all thoughts and opinions are my own. We seriously LOVE Maty's and their natural products really work great.